Maguire and his colleagues attempted to answer that question by enrolling 1,300 healthy children between the ages of 2 and 5 in a study that relied on the help of TARGEt Kids!, a collaboration effort between the children’s pediatrician and scientists from St. Michael’s Hospital and the Hospital for Sick Children. Children involved in the study made standard visits to their pediatricians between 2008 and 2010. Parents were also asked to complete comprehensive surveys in which they answered questions about their kids’ milk drinking habits and other factors that can impact iron and vitamin D storage. Children also gave blood samples so that their iron and vitamin D stores could be analyzed in the lab. 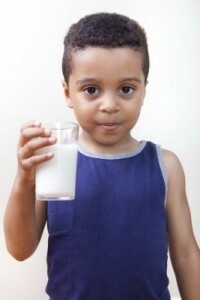 After looking at all of the data, researchers found higher vitamin D stores in children who drank more than two glasses of cow’s milk a day. Unfortunately, these same children were also found to have lower levels of iron. Researchers also noted that children with darker pigmentation may fall short in vitamin D levels during the winter months. Rather than drink more cow’s milk, Maguire suggested that these children should take vitamin D supplements during the winter to ensure they’re getting enough vitamin D without sacrificing their iron stores.